The hill north of the Cultural Center is known as Expo Hill, named for Exposition Hall, one of the Fair’s original buildings that majestically sat atop the hill. It is now the permanent home of the 133-foot wind turbine and education center in addition to several interactive displays during the Fair. In August of 2010, The Blue Ribbon Foundation received a $250,000 grant from the Office of Energy Independence to create an area showcasing renewable energy technologies. With matching funds from MidAmerican Energy, the landscape of Expo Hill has been given a “green” renovation. Divided into two phases, features for the 2011 Fair included a solar panel system (array) placed on the MidAmerican Energy building. This array powered an interior computer display showcasing the energy produced by the array and turbine and what is then being used by the building. New landscaping beginning at the tram stop on Grand Avenue will create a path with plaza areas extending up the hillside, providing a new entry point to Expo Hill. The landscaping incorporates bio-swales to utilize vegetation in filtering run-off and featured solar powered landscape lighting, solar cooled benches and solar powered Wi Fi benches and eventually, sculptural solar lighting features. Once in place, the Fair will measure the viability of the solar lighting and bench technologies for possible incorporation throughout the grounds in future years. 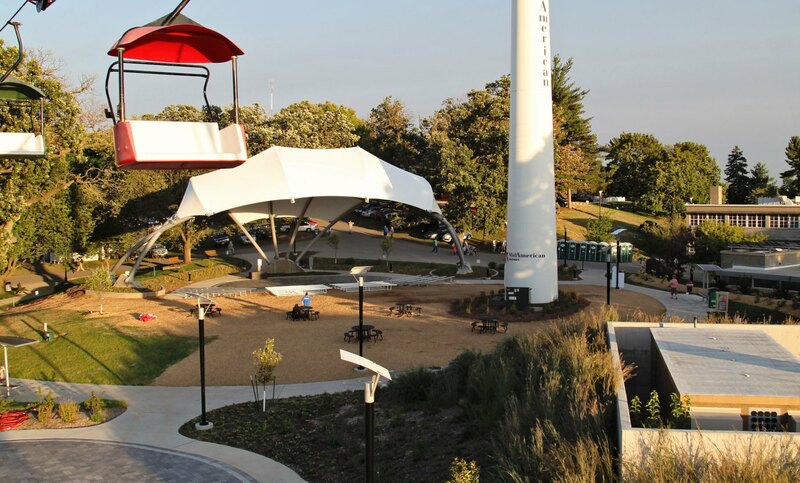 Phase 2 of Expo Hill, completed for the 2012 Iowa State Fair, included a stage area and additional features such as LED lamp posts, solar powered cooling benches, solar pavers and bollards that light the new concrete paths and stairways. A few finishing touches are still set to take place prior to the 2013 Fair, including the installation of the solar film on the stage covering which will provide solar powered energy for the stage. If you have only experienced Expo Hill during the day, be sure to visit at night to enjoy a whole new ambiance!